Braveheart Brewing is an idea born of individuals with a heart for service and a desire to give back to those who defend our freedom. Veteran owned and operated, Braveheart’s mission is creating craft beer that truly “tastes good and does good.” Braveheart Brewing is honored to support the POW-MIA Families, Intrepid Fallen Heroes Fund, Seal Family Foundation and 03XX Foundation with contributions from every sale of Braveheart Brewing brands. 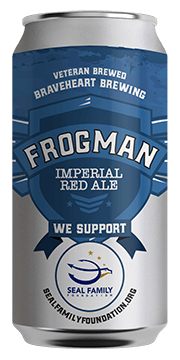 Offering POW MIA Pilsner, Intrepid Hero IPA, Frogman Imperial Red and Semper Fi American Wheat Ale, Braveheart is proud to provide an opportunity for everyone to give back while enjoying delicious craft beer. 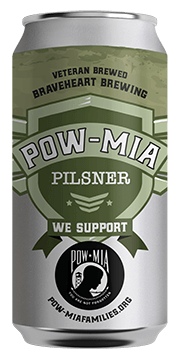 This Classic American Pilsner is brewed in honor of all of the POW-MIA personnel of the United States Armed Forces. Our pilsner is a crisp, dry, easy drinker that is made with all American malt and what else but classic American hops! A touch of Crystal 10 malt gives a touch of honey sweetness and we achieve a pleasant bitterness from Liberty and Cascade hops. Enjoy responsibly and never forget our POW-MIA heroes and their families. We support Pow-MiaFamilies.org because their mission - to obtain the release of all prisoners, the fullest possible accounting for the missing and repatriation of all recoverable remains of those who died serving our nation - is so important. We believe it's a cause well worth supporting, so we're providing a contribution to this great organization from the sales of Braveheart Brewing brands. 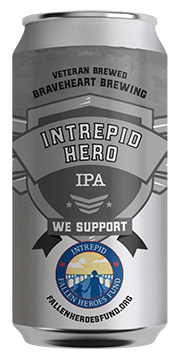 East Coast meets West Coast in this IPA that honors our Intrepid Heroes from the four corners of our great nation! This IPA pours hazy reminiscent of an East Coast IPA and contains an obscene amount of West Coast Hops. We have made this IPA "sessionable" at 5.6 ABV and 59 IBUs but be warned, the flavor is truly something to behold with amazing malt flavors coming from All-American 2-row barley and Crystal 30 malt. Finishing hops include, Centennial, Chinook, Amarillo, and Simcoe. A big salute to all of the Intrepid Heroes. The Intrepid Fallen Heroes Fund serves United States military personnel experiencing the Invisible Wounds of War: Traumatic Brain Injury (TBI) and Post-Traumatic Stress (PTS). When our Servicemen and women return from the battlefield, they help them fight The War Within, by building “world class”, advanced treatment centers providing the best TBI and PTS care, enabling them to continue to serve on Active Duty and enjoy a productive life. 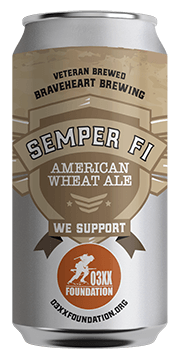 A great organization we're proud to support from the sale of Braveheart Brewing brands. Curious where you can find our beer, or want to learn more about us? We’d be happy to help! We’re always looking for beneficial partnerships that can help elevate your organization and Braveheart Brewing. We are interested in developing new beer releases that support great organizations, and we also look to develop benefits and events in communities. If you are an establishment that would like to carry our beer on tap, sell by the can or sell our 6 packs, we'd love to talk.